Five months have passed since I was first admitted to hospital and I’m now in my 5th cycle of chemo. Life is so different to what it once was. It’s not entirely predictable, but it’s begun to take on some rhythm and routine. My life currently revolves around three weekly cycles. I gear myself up for the next chemo and then prepare to go downhill over the following week or so. Days 5, 6, 7 are usually pretty tough. Aching joints, pains, nausea, constipation, fatigue, skin rashes, headaches have become the new normal! But then the side effects fade away and I rebuild. Sometimes in the third week I can even forget that I’m unwell. 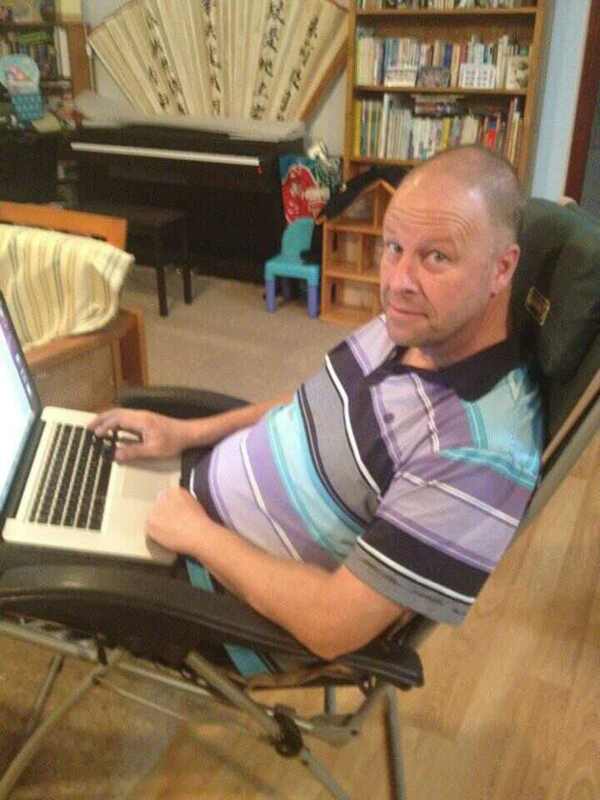 The good news is that my new ‘maintenance’ chemo regime seems to be more tolerable. I haven’t had the same severity of symptoms. The roller coaster hasn’t dipped so low. I’ve even continued my daily coffees! My appetite hasn’t dropped – this has has created a new problem with me putting on too much weight. But there are still bad days, even really bad days, and I need to be prepared for these. I’m learning to plan ahead and work with these rhythms. Some days are good for catching up with people, some not so. We’ve been able to arrange some days away as a family. I’ve been able to plan to preach on certain weekends. We’re looking forward to a few friends coming to visit on some (anticipated) good days ahead! Unfortunately, the Brumbies schedule hasn’t followed my routine. I haven’t been able to build consistency in my involvement with the team. I get to be at some games live at the stadium, and other times I’m stuck at home, grateful for Foxtel! Though I still get frustrated and impatient with my limitations, I am learning to go with the flow a bit more. There are times to rest and times for activity. When the energy levels allow, then I’m keen to get out and about, to catch up with people, to talk. When I ache, or feel weak and unwell, then my goals are more limited. Perhaps, this is the time to reply to a few emails, make a phone call, read a chapter of a book, or write another post. My family know there are times when I can do things and times when I can’t. They’ve been very patient with me and shown great care and concern. There are some areas where I haven’t adapted well to my new rhythms. It’s important to build gentle regular exercise into the routine, but it’s not really happening. I’m keen to be reading the Bible and praying regularly with Fiona, but we’re haphazard at best. We want to be spending more time talking things through with our children, reading and praying together, but we get distracted by all that’s going on. I’ve been a ‘twice every Sunday’ church attender most of my life, but now I can’t even make it every week. And I’m often too exhausted to back up on a Sunday evening after going along in the morning. Preaching twice on a Sunday recently was a big challenge! But, I’ve discovered that I approach church a little differently now. Previously, I’ve been focused on my sermon, or the details of leading the church. Now that I preach only rarely, I find myself more relaxed at church. And because I’m not spending as much time mixing with people during the week, I look forward to Sunday interactions even more. I’m more conscious of wanting to make my time count with people and to talk about the stuff that really matters! The shape of my ministry has certainly changed. I’ve spent years and years focused on the spoken word and now find myself spending more and more time on the written word. My desire remains for people to discover the joy of knowing God and to discover the difference that Jesus makes to life. It’s wonderful to hear when something I’ve written has been an encouragement to someone. I thank God that blogging has pushed some people to ask questions, to explore issues, and to begin conversations about the big issues of life (and death). As I write this, I’m spending a couple of days away with our church staff team. It’s great to be a part of the conversations, the planning, the prayer, the brain storming. But it’s also a reminder of how much has changed. I’m not working hard these three days, pushing the agenda, pulling everything together, focusing on action plans and outcomes. I’m no longer the senior pastor! I’ve gone from a leading ministerial portfolio to being a backbencher! Last year I was captain coach and now I’m an interchange player! I don’t resent this. In fact, it’s a relief (especially given my health and resources) not currently having the buck stop with me. It’s important to have the freedom to be involved as I’m able, and to not be involved when I’m unable. And I thank God that our church is in good hands with our new senior pastor! There are challenges ahead as I explore what I can and can’t do. Who am I now? For so long I’ve been the leader, my job description has been defined, my responsibilities have been clear, and I’ve known what I have to do. Now I find myself asking new questions. How do I fit in? How can I complement the others on the staff team? What can I do given my limitations? What will make the biggest impact? How can I keep serving, learning, growing? Are there things that God has in store for me, which would never have been possible except for this cancer? They’re difficult questions to answer, because I don’t know what the future holds? But then, who does? We make our plans, but the Lord determines our steps. 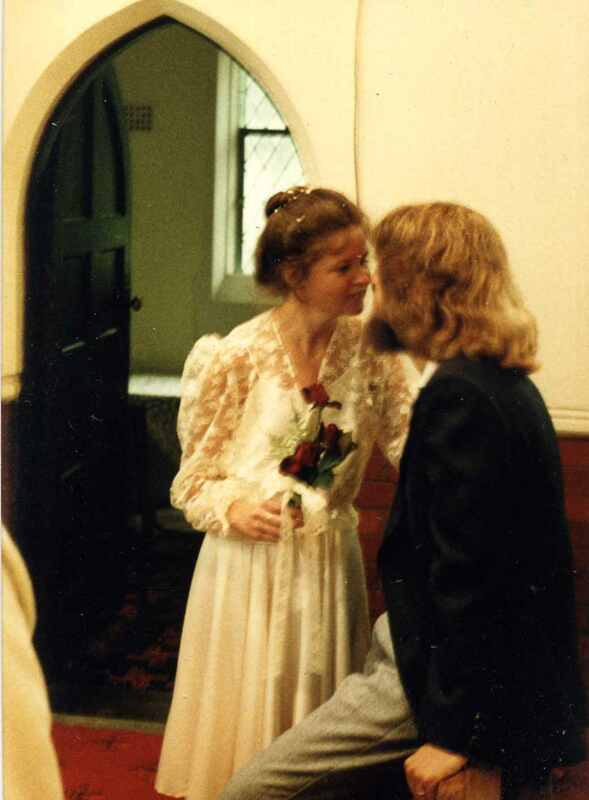 Simple Church begins with a story about Pastor Rush who, I was convinced, was modelled on me! He’s aptly named because he’s always rushing from one thing to the next. Preaching, visiting, planning (occasionally), emails, emails, emails, meetings, business, admin, family, sports, evenings out with work, days away with conferences, more conferences, patching up problems, helping people resolve conflicts, preparing on the fly, constantly tired, stressed, adrenalin driven, and every week having to do it again! Sound familiar to some of you? Simple sounds very attractive. I long to get rid of the clutter! Simple is where it’s at. It’s the latest trend. Look at Apple, Google, designers, marketers, book titles… and now churches! This book offered something I was craving. It promised to be my ‘ministry stress detox diet’ and I was keen to take it in! It launched me reading widely on ‘church’, not just about the theology of church (as I’d read a lot of good stuff on what church is), but about how we put things into practice. Let me start by saying what I didn’t like about Simple Church. Firstly, it was too long. How simple can something be if it takes over 250 pages to explain it? At times I found the book annoyingly repetitive and protracted. What I’d really like to see is a condensed version of Simple Church. One that comes to about 20 or 30 pages in length. I’m a big fan of little books! There is a revised edition of the book out now. It includes lessons learned since the first edition. But it’s longer rather than shorter! And fourthly, this book makes all kinds of assumptions about the place and purpose of the church without grounding them clearly in the Bible. There is very little engagement with the Bible, and the foundations of the book seem more sociological than theological. The risk is that this book could simply help a church, with appalling theology, do what they do even better, rather than changing what they do! So I recommend getting a good grasp on God’s design for the church in the Bible, before you get too heavily into Simple Church. A good starting point would be detailed study of the books of Ephesians and Hebrews, combined with reading Understanding the Church by David Jackman. Now that my gripes are out of the way, let me say this is a very useful book. It’s provided the paradigm for our ministry team to evaluate how we’re travelling as a church. It’s given us a template for thinking about the shape of the Christian life, how we are growing followers of Jesus, and how we encourage this in our church. 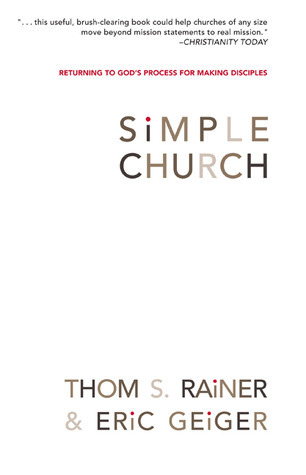 The authors, Rainer and Geiger, define a simple church as a congregation designed around a straight-forward and strategic process that moves people through the stages of spiritual growth. (p60) Each part of this is significant. It’s designed, thought out, structured, not just thrown together. The process is straight-foward, clear, easy to grasp, known to the leaders and the congregation, and doesn’t keep changing according to the latest fad. The process is strategic, tied to the purpose and vision of the church. It moves people, logically. Church programs are means, not ends in themselves. They provide ways to help people grow together spiritually. The overall plan is for the church to cooperate with God in seeing people’s lives changed for eternity. In considering ‘stages’ of spiritual growth, we shouldn’t consider discipleship as a sequence of steps or courses to be completed. However, we want to see people progressing as Christians and growing together into maturity, so we should consider what we are doing as a church to help this happen. The task of creating a simple church begins with clarifying what discipleship is and how it will happen in our church. Let the Bible inform our picture of what growing Christians and a growing church should look like. Then we work out what needs to happen for the church to grow disciples. Specifically, in the terms of the book, what processes need to happen? Of course, narrowing down processes will be somewhat artificial, but it has the value of clarifying where we will be headed. We don’t start by assuming our pre-existing church programs. Rather, we ask what programs will facilitate this process of disciple making. For our church this has meant identifying three steps in the process: connecting, growing, and serving. We desire to see people connecting with God and each other through the gospel of Jesus. We desire to see people in the church growing together into maturity through applying God’s Word in their lives. And we desire to see people using their time, resources, and gifts in serving the church and the people around us (especially in helping people connect and grow). Once the process is designed, it needs to be implemented. This involves placing programs alongside the process. If you are auditing your existing programs in line with your clarified process of disciple making, then this may be rather confronting. There may be areas of the process that are completely unaddressed. You may have programs that you can’t fit in anywhere. You might discover the need to refocus some of your programs to reach your goals. We’ve followed the example of other churches by specifying some programs as integral to our process. For example, we run a regular ‘connect’ course that is designed to be an entry point for connecting people into our church. It is designed to introduce them to the message of the gospel, to the vision of our church, and to people at church. This helps some people to decide that our church is not for them and others to be clear about what they’re jumping into. Once people have decided that they want to be part of the church, we then encourage them into ‘growth’ groups which provide a relational context for people to grow together spiritually. Then, as we get to know people in growth groups, we can encourage them to ‘serve’ in ministry teams throughout the church. We have many service options including kids ministry, youth work, music, welcoming, international student outreach, and much more. The next step is to get the whole church aligned with our process. This means the leaders, the programs, the calendar, the announcements, the congregations, everything and everyone. People and programs need to be held accountable according to our agreed process. Staff should be recruited and deployed according to the process. Understanding and unity are increased through such alignment. And we avoid clashes and clutter. Simple Church has pushed us to consider what programs are critical to disciple making, and to make these programs our focus. But we still have a long way to go in creating alignment across our church and its various programs. People appreciate clear processes, purposeful programs, and the unity created by people moving together in the same direction. People love clarity, focus, and simplicity. But if you try to axe their favourite program because it doesn’t contribute to the process, watch out! We grow very attached to the things we create and maintain. We’ll probably disagree that our program is part of the clutter! So, lots of love, care, skill, and communication will be needed if we’re going to get all our programs aligned to our process and purpose. And it might take some time. Change can be very difficult. It involves loss and grief and uncertainty. Some things disappear while others take their place, and not everyone is happy. But if we’re failing as a church to grow followers of Jesus, if we’re simply going through the motions, propping up the programs, and feeling constantly, mind-numbingly, busy, and without clear purpose… then change is essential. Of course, we can make these changes without ever reading Simple Church. And there are other good tools available to help us. But if we’re stuck in a bit of a rut, and we’re keen to see our churches growing followers of Jesus, then it might just be worth a look! Patience has never been my strong suit. You’ve probably heard about the person who prays, “Lord make me patient, and do it now!” How does God answer that one?! I just want to be better… now! I want to get off the chemo and onto drugs that don’t hurt… now! I want to be fit again… to run, lift weights, throw a football, climb stairs easily, catch waves, join my friends on bike rides… NOW! The family are off being active and I’m just climbing out of bed after a nanna nap! Do I take panadol for the chest pain, the sore head, and the aches in my joints? Or do I hop back into bed and hope it will go away? Do I push through the pain barriers? Or do I rest and let the body catch up? I’ll tell you, there are no easy answers. Most of my life I’ve maintained a reasonable level of fitness. Running, swimming, walking, riding, lifting. I’ve never been a top class athlete, but I’ve never felt disabled either. That is, until now. And I don’t like it! This year I’d planned to be active, really active. I was going to be a barra fishing, pig shooting, motorbike riding, four-wheel driving, pastor in the NT! We were looking forward to a physical, outdoors lifestyle. And now I’m stuck inside, hiding from the cold, unable to shake a cold. So what on earth does God have to teach me? Patience… I’m a slow learner! And I usually have to learn the hard way. There’s lots I need to learn, but patience has to be right up there. I need to be reminded that this world is not the way God intends it to be. I’m not the way God intends me to be. It’s not how things started, and it’s not how they’ll finish. God has big plans and he’s not done yet. The Apostle Paul reflects on the chaos and suffering he sees in this world and he helps us to get things back in perspective – God’s perspective. I don’t have to be satisfied with how things are… because God is ok with me longing for things to be better. I don’t have to pretend that the world really is wonderful… because God reminds me that it’s been subjected to frustration. There’s no point putting on a brave face and doing all I can to improve my lot… because God has put into place his plan to renew all things. So what does he ask of me? To put my hope in him, and to wait, patiently. As I opened the Canberra Times over breakfast this morning, I was intrigued to read an article on the Bible. Stories about the Bible are rare in the papers, but this one’s rather special. The Bible belonged to Lance Corporal Elvas Jenkins. He placed it in his shirt pocket and it took a bullet for him at Gallipoli on May 7, 1915. It’s a great story. The lead shrapnel bullet from the shell of a 75mm field gun went through the Psalms and lodged in the Gospels! The Bible literally saved his life… that is, until he was killed a year later while heading a reconnaissance party on its way to the Battle of Somme. 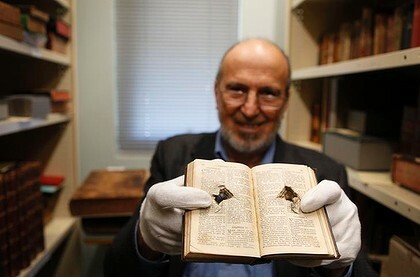 Now, nearly a hundred years later, this little Bible has come to rest in Canberra! Very cool to be saved by a Bible tucked into your shirt pocket, and a testimony to God’s kindness to him that day. But then, it could have equally been a tobacco tin that saved him, or a pocket watch, or something else that could withstand the shrapnel. These days, I guess it would be more likely a kevlar jacket, or some other piece of high-tech armour. So why get excited about this pocket Bible saving his life that day? The Bible offers real hope to the dying. The evidence of the life, death and resurrection of Jesus shows us that death doesn’t have the final say. Life beyond the grave or the crematorium isn’t just an empty wish, but a rational expectation based on the evidence of Jesus Christ who has made it possible. It’s worth grabbing a Bible and reading one of the four Gospels – Matthew, Mark, Luke or John – to find out more. Last year, I purchased the ‘wrong book’, and read it by accident – and I’m so glad I did. 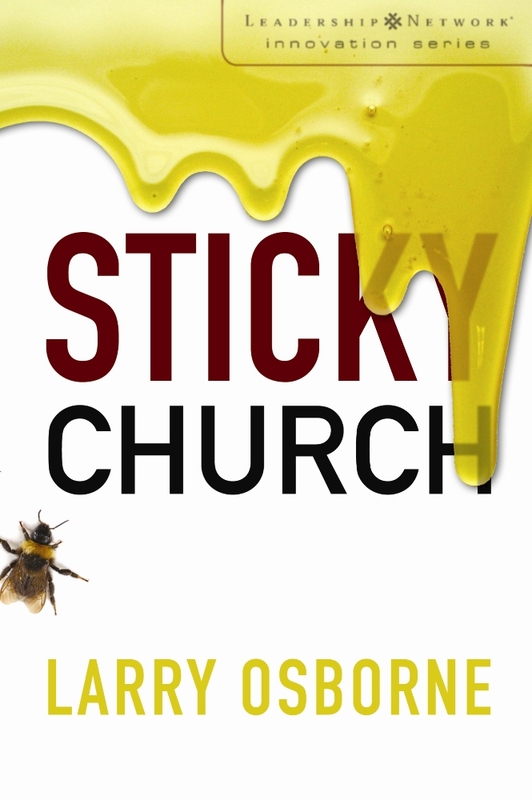 Sticky Teams had been recommended to me as a helpful book to consider our organisation and direction as a church, but I mistakenly ordered Sticky Church by Larry Osborne instead! It took me a while to appreciate that this was a different title by the same author. And it proved to be even more important in thinking about how we were doing church. As a senior pastor/team leader/preacher I’ve applied myself to the crafts of leadership and communication over many years. There may be 100 or more books on my shelves touching on these areas. But I’d probably only read 3 or 4 books on the topic of small group ministry, and none that had really explored the strategic importance of a well integrated small group ministry in a growing church. Sticky Church has begun to fill this void and pushed me to explore other material in this vital, and yet overlooked, area of our ministry. The book begins by tackling the matter of how we grow our churches. While many churches work hard to get people in through the front door, they leave the back door wide open and people don’t stick around. By contrast, Osborne’s church does no marketing, gets plenty of visitors and inquirers, and focuses on building genuine connections with those who come. In short, small groups are seen as the key to closing the back door, by building real relationships in a context of ministry, Bible, prayer, and life experience. Imagine two churches that each grew in attendance from 250 people to 500 people over a 10 year period. Church A is a revolving door. It loses 7 people for every 10 it adds. To reach 500, it will have to add 834 new members of attenders. Church B is a sticky church. It loses only 3 people for every 10 it adds. To reach 500, it has to add 357 new members or attenders. On the surface, both churches appear to have doubled. But the revolving door church had to reach reach 834 new people to get there, while the sticky church only needed to reach 357. Obviously, doubling attendance is a lot easier for the sticky church than for the revolving door church. No surprise there. But here’s the kicker: After ten years, the church with the big back door will have 500 attenders and 584 former attenders! And every year after that the spread between the number of ex-attenders and the number of current attenders will grow larger. Osborne is committed to having 80% or more of church attenders actively involved in small groups. He sees the groups as the hub of the ministry. And he sees this model as fully scalable. The same principles that make a church sticky with a hundred or so in attendance, continue to work as the church grows into the thousands. Osborne’s church, North Coast Church, is a mega church in Aussie terms and may lead some of us to tune out as to the relevance to our contexts. However, it took them five years to reach 180 attenders and another five to reach 750, and they worked hard at the small stuff along the way. How do we convey the value and importance of groups to the life of our church and the spiritual vitality of our members? Growth in churches is often crippled by what Osborne describes as the ‘holy man myth’. This is the idea that pastors have a more direct line to God. They are seen as the ones who must teach, visit, pray, counsel, and do pretty much everything. Especially if we’re paying them to do it! Aside from the poor theology driving this myth, the harsh reality is that one man simply can’t do all these things. My observation is that if a church or its ‘holy man’ thinks he must do everything, then we are not likely to see the church grow beyond 100 to 150 people. Healthy small groups are a valuable means for decentralising the ministry, and empowering people within the church to use their gifts in service of one another. This book promotes sermon based Bible study in small groups. Our church had only done this occasionally, usually for a specific purpose such as focusing the whole church on a theme. People expressed appreciation for the guidance and resources, but we’d never managed to keep it going. From my perspective it was hard enough getting the sermon done well, let alone adding the preparation of small group material. I’d seen others committing to it over the years, week in week out, and in some cases preparing their whole series of Bible study notes before the preaching even began. I would just sit back and marvel at how they could pull it off. I’d leave it for the Phil Campbells, Steve Crees, Craig Dobbies… it wasn’t for me! 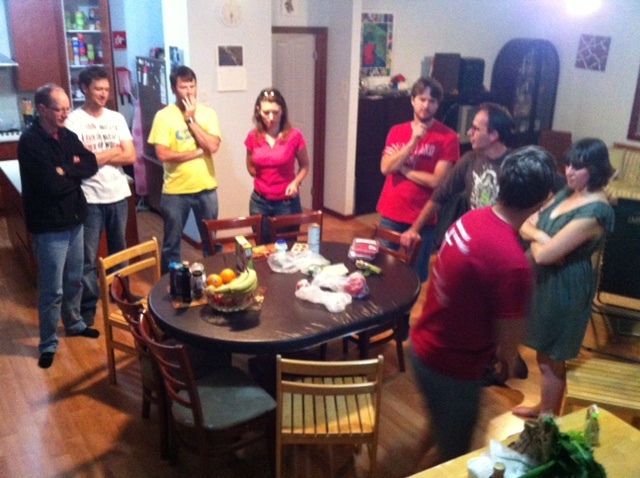 But, Sticky Church has pushed us out of our comfort zone to develop a sermon linked small group Bible study strategy. We haven’t managed to write a series in advance yet. Mostly the studies are produced and distributed week to week, ‘just in time’ for leaders to work over material and prepare for their groups. They are sermon linked, rather than based, because we don’t want people just rehashing what the preacher said on Sunday. We want people getting back into the text, doing some work themselves, and applying it in their lives. Some groups like to follow the sermon with the emphasis on further exploration and application. Others have opted to precede the sermon with the study, aiming to get people more engaged in the observation and investigative processes, raising their questions, and whetting their appetite for a sermon to follow. Horses for courses, but I think that in our context we will benefit from a greater commitment to applying the Word in the context of relationship with one other after the sermon. So I’d tip the scales towards sermon first – small group studies afterwards. There are a few things that have moved us in this direction. Feedback from some of our leaders has shown that they have worked hard on preparing Bible studies from scratch and devoted little or no time beyond this to leading and caring and promoting the ministries of others in their groups. Some haven’t even seen this as their role. (This probably says more about our poor communication of expectations and encouragement of leaders in their roles). Just focusing on preparing and leading studies is commendable at one level, but if we are seeking these groups to become ‘little church’, where people are being fed, encouraged, caring for one another, and encouraging each member to be connecting with people who don’t follow Jesus… then the leaders need to be helped to embrace a larger job description. Not simply preparing and leading studies, but leading people, and this takes time. If we can resource the leaders with material, this will give them a leg up. Some leaders follow our material pretty much as provided, while others use it as an aid for their own specific preparation. We’ve also seen the positive benefits of having the entire church learning together the same or similar material. In fact, on the occasions we have been able to integrate youth and children’s material with the adult preaching and small groups, we’ve had great feedback from families. By linking to the sermons, people have had the benefit of the preacher’s hard work combining with the group working through understanding and application of the Bible together. As we put our sermons on line, people who miss church are able to download the talk before attending (or even leading) their small groups. This seems to be increasing people’s engagement with the Bible and with working through its implications for life. Osborne’s church has worked to keep their groups aligned with the mission of the church. They are not seen as optional accessories, but integral to the church fulfilling its purpose. They desire to 1) enlist new followers into God’s kingdom; 2) train them how to live the Christian life; and 3) equip them and deploy them into service. Small groups are vital to this process. There are some interesting particulars how about how North Coast Church groups function. People sign up for a term at a time, and are then asked to provide feedback at the end of each term, which includes indicating whether they will be remaining with the group the following term. Osborne says that providing a clear way out of groups has led to more people staying in. Groups are not divided into two as numbers increase. In fact, he has a whole chapter on Why dividing groups is a dumb idea. He notices that some people take forever to click with a group that works for them, and then we cruelly split their group and they’re lost again. Their answer lies in two strategies: starting new groups for new members, and hiving off leaders rather than dividing whole groups. We’ve basically adopted this approach and begun to see the advantages of moving newcomers through an introductory ‘connect’ course into a small group with the people they’re already getting to know. There is some good stuff on finding and developing leaders. Look for spiritual and relational warmth in prospective leaders. Avoid hyperspiritual God-talkers and single-issue crusaders. Look to apprenticing leaders within existing small groups, or else find people with few preconceived ideas or baggage about how groups should be run and prepare them to play on the team. Grabbing a leader who did things differently in their previous church, without engaging them with the vision of your church, can spell disaster! And it’s better to ask for recommendations, rather than asking for volunteers. I also appreciated the creative rethink on how we go about training leaders. The emphasis is on preparing leaders on the job, for the job. Keeping the information flow with resources, encouragement, tips, suggestions, and ensuring that groups are well connected with the wider ministries and mission of the church is vital in equipping our leaders. This hasn’t been our strength to date, and we’re seeking to improve. Osborne also addresses the different needs of rookie and veteran leaders. This is something we should probably consider more. Finally, the last section of the book includes tips for preparing sermon based studies. For mine, this is not the high point of the book, but it’s worth reading as we review our approach and strategies. And there are a number of appendices that show how North Coast Church puts their model into practice. I’m very glad that I stumbled onto this book. Not simply because of it’s great ideas and practical common sense, but especially because it reminds me that if we’re expecting our small groups to be the hub of our ministry, and a primary pastoral care context, and the leaders to run with this vision, then we must invest more in helping them to work well.